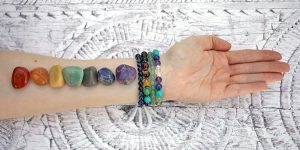 Spirit Connexions Chakra bracelets are made from high energy, high vibration, top quality semi-precious gemstones. If you are serious about working with your Chakras, you’ll love any one of our gemstone Chakra bracelets. Whether you’re looking for a gift, something to wear every day, or for that special event; our chakra bracelet collection will leave you spoilt for choice.